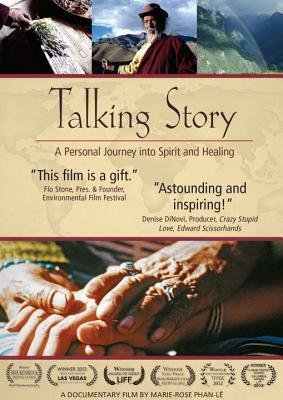 Award-winning documentary Talking Story takes viewers on a fascinating adventure into the world of healing, shamanism, plant medicine, and divination. Learning that many indigenous cultures are on the verge of losing their medicinal plants, healing traditions, and spiritual knowledge as a result of habitat destruction, cultural assimilation, and globalization, filmmaker Marie-Rose Phan-Lê sets out on what becomes a life-changing journey to record the disappearing traditions of authentic mystics and shamans, discovering her own gift as a healer along the way. From Hawaii to the Himalayas, the film follows Phan-Lê as she meets with healers and shamans, and transports viewers into a world of exotic places, esoteric practices, and practical applications in the art of healing. While chronicling the lives, rituals, and wisdom of the elders she meets, Phan-Lê is surprised to experience events that cause her to emerge from behind the lens and to accept herself as a healer. MARIE-ROSE PHAN-LÊ has more than twenty years of experience in film and television production. Beginning her career at the CBS affiliate in Phoenix, Arizona, she later expanded her work to include commercial production, episodic production, television development, feature film production, and media consulting. The founder and president of Healing Planet Project, a nonprofit dedicated to the preservation and presentation of healing and spiritual traditions through media, Phan-Lê is the writer, director, and producer of this award-winning documentary film along with its companion book of the same name. "Marie-Rose is one of those rare individuals whose personal story elevates our perception and experience of our own lives. Her journey through the world of esoteric healers and her own experience as a healer and spiritual guide, told in Talking Story, her equally compelling film and book, open a window into a more meaningful and transcendent world that anyone looking for answers will find both astounding and inspiring." "Eleven years may have seemed like a long time to complete a film, but it is clear that all the effort put into the travel and the experience being with and learning from exceptional healers was fully worth the effort. The personal journey is so generously and beautifully shared. This film is a gift." "It is rare to see a film that is filled with such rich spirituality yet delivered in such a human way. Talking Story is such a film. It held a fine balance of both worlds, which is rarely achieved on screen. I fell in love with it from the beginning and have told all my special friends this is a film to see." "Some filmmakers talk about the spiritual journey, but Talking Story puts you on the road with all the travelers. Marie-Rose takes the heroine's journey to a new level and we are invited to walk alongside her. The result has a profound impact on her life and similarly, on each of us." "Life is filled with wonder, most of it built upon the past and how the past impacts the present. Understanding indigenous tribes, grasping history, and comprehending both spiritual and medicinal healing is crucial to mankind’s progress. M-R is taking us there by discovering her own healing powers, studying cultures to make herself a stronger healer and preserving that which has come before her. Through the storyline of personal growth, Talking Story educates the viewer on the mysteries of healers from around the world. This is more than a documentary; it is a brave and inspiring journey of personal discovery."